Our company manufactures and supplies exclusive Menâ��s Leather Wallets. 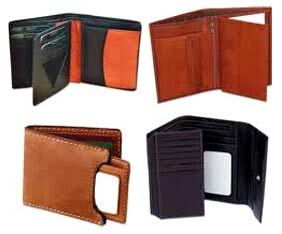 The Menâ��s Leather Wallets which we offer is made from high-grade Leather, procured from the reliable vendors. These Menâ��s Leather Wallets have smooth finish and are light weight, scratch resistant, spacious with superior stitch, and excellent quality. One can avail the Menâ��s Leather Wallets from us at the pocket friendly rates.